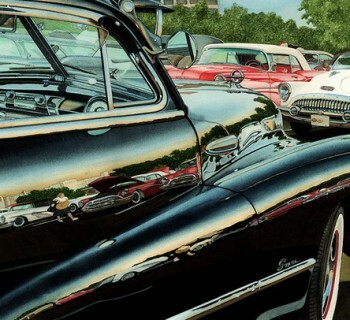 Automotive Artist Ronald Hulleman is a multi-talented designer. He uses a unique technique to play with reflections. Find out how. When I met him at The Gallery in Brummen he told me that he had had two appointments that morning. 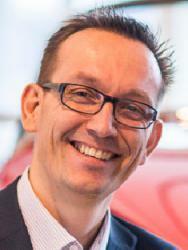 The first one was on designing a villa and the second on illustrating the packaging materials for an Audi component. Since he started his career in automotive design, after finalizing his Art study, he has taken on many different projects. However cars have always been a continuous factor in all his works and life. Hulleman his automotive artworks are part of several corporate art collections in Europe and he did several expositions. His most recent exposition is currently at The Gallery in Brummen, the number one place of exclusive classic cars in the Netherlands. 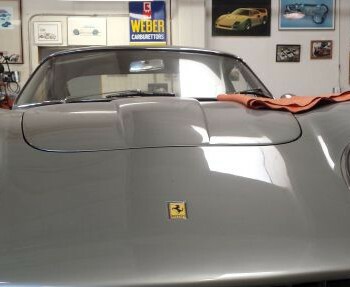 Ronald is visiting the Gallery frequently to find new inspiration for his automotive art. As an example Ronald showed me his painting of a Triumph Spitfire. The background shows a swirl of colors, fading into each other with an almost psychedelic effect. The red car on the foreground perfectly blends in but not by coincidence. Ronald pointed out to me how the colors on the right side of the car reflect in the wheel rims. The side of the car shows the reflection of the horizon. The chrome on the front reflects the background colors from the right side of this artwork. The same effect can be found here on the wheel of a Cistalia. Another result of his passion for reflections is the emblem of the Maserati. The grill is beautiful reflecting in the circle surrounding the Maserati trident. In combination with the reflections in the bright red lacquer thisautomotive artwork is a beautiful masterpiece, demonstrating the skills of the artist. Creating the C11 Mercedes was a completely different challenge. Painting the complex structure of the engine, with its many details, was a painstaking, labor-intensive process. The result is stunning. This painting is a true tribute to the automotive engineers whose work is normally hidden behind the bodywork of the car. The original artwork is part of the Kroon Oil corporate automotive art collection. The backgrounds for his artworks have become a kind of personal signature. A variety of techniques and materials are being used to create the desired effects. Ronald even used ingredients from his kitchen like Salt and Nutmeg beside his Oil, water and Acryl paints. The backgrounds are made separately from the car paintings. Both images are than scanned and combined into one digital illustration. Not all his artworks are made this way, the Talbot-Lago T26 for example was totally hand painted without the use of digital techniques. His exposition is quite a success so if you have a chance, visit this exposition before the 4th of September at The Gallery in Brummen, The Netherlands. Automotive Artist Ronald Hulleman has his own website at www.RonaldHulleman.com where you can find more of his artworks and can contact him for commission work.